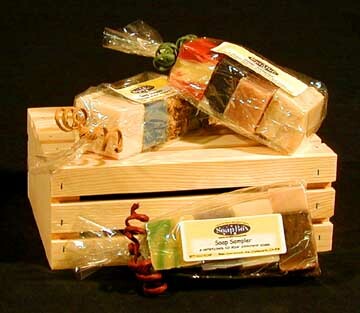 Our Soap Samplers are cute little packets of 4 one-ounce pieces of our fabulous soaps. We have divided them into two different packs which represent 8 of our Soaps. You can choose (below) which of the two you would like. The samplers are $5.00 each. We're working on re-doing the look. If you're having a hard time remembering which soaps are which - click here - to go back to the Soap page and remind yourself what you like! Please click here to View Your Shopping Cart! Please click here to Go straight to Check Out! You'll be happy to know that similar to the way in which we create our products, our packaging is natural and environmentally friendly as well... from the wooden crates (hand made in Oregon) to the cellophane wrap (which is a biodegradable, natural wood product). more Bath Gels, Tub Tempest, Salt Scrubs and more......! !